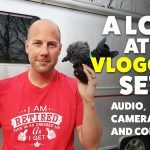 On this Airstream Life vLog, we take the free 45-minute tour at the Smoke Jumpers Museum after a recommendation from a viewer, Chris. It was an awesome tour and incredibly interesting. We knew almost nothing about Smoke Jumpers before it! After the tour, we head to the Montana Distillery for Martini Monday and enjoy some delicious but very different cocktails!